Taiji (tai chi), meaning "grand ultimate" or "grand extreme", first appeared in Yi Jing, Scripture of Changes; quan, meaning "fist", is a word used as a suffix in the Chinese language to denote a certain martial art system. Taijiquan (tai chi chuan), thus, is a complete martial arts system incorporating the taiji principles rooted in the various manifestations of the two oppositional, yet, at the same time, reciprocal energies - Yin and Yang, which can be observed, explored, and experienced as the substantial and the insubstantial, the soft and the hard, the fast and the slow, the tense and the relaxed, the expanded and the contracted, the open and the closed, etc. Traditional Chen Taijiquan, Lao Jia "Old Frame", is widely acknowledged as the oldest and the ancestor of all other Taijiquan styles. It was created by Chen Wangting, 9th generation ancestor of the Chen Family. He created taiji as a family art with the intention of passing it to his descendants. Out of respect to Chen Wangting and to give the Chen family credit for being the inventor of this art, Traditional Chen Taijquan is commonly known as Chen Shi Taijiquan, meaning Chen Family Taijiquan. In the United States today, many Taiji practioners have benefited from the teachings of Grandmaster Chen Qingzhou (19th generation direct Chen family descendant from Chen Village) and he is highly respected for his lifetime devotion in preserving the Traditional Chen Taijiquan, which is widely known as Zun Gu Taiji "Revere the Ancient Taiji", of the Chen Zhaopi line without modification to its true original form. The ancient art of Traditional Chen Taijiquan can be practiced solely for its health benefits and/or as an internal martial art. Research has shown that when Taiji is practiced with a graceful, slow, and light movement, it can enhance longevity in old age, with its deep regulated natural breathing, relaxed frame of mind, and smooth circular movements. Today, regular and consistent practice of Taijiquan has proven and shown remarkable success as a curative for many health problems. Created originally as a martial art, Traditional Chen Taiji also offers a complete and robust (:-) martial art system. 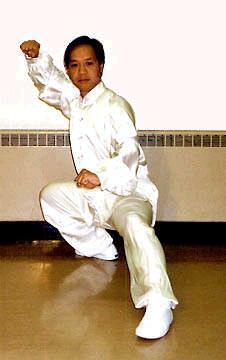 Zun Gu Taiji, when practiced as a martial art, is characterized by low powerful stances, supple whole-body twining/coiling movements, stomping, and explosive releases of power. This internal martial art embodies both yin and yang energies expressed through applications of peng "to expand, maintain", lu "redirect, deflect to the side", ji "press forward", an "press downward", cai "pluck and pull down", lie "split", zhou "elbow strike", kao "leaning strike", zhan "contact", lian "connect", nian "stick", sui "follow", teng "jump", shan "dodge", zhe "break", kong "empty", shuai "grapple and throw to the ground", da "strike", qin "capture", na "hold, grasp" (Chen, Qingzhou, 2002). Training in Zun Gu Taiji encompasses not only zhan zhuang "stand post" practice, bare hand routines, and push-hand practice but also various tool and weapon sets including Taiji sphere, Taiji bang "ruler", Taiji dai "bag", Taiji dao "broad sword", Taiji jian "sword", Taiji gun "pole", Taiji qiang "spear", and Taiji guandao "General Guan's knife" (Chen, Qingzhou, 2002). All together, the system builds up the practitioner's qi "vital energy", concentrates on developing the practitioner's stability, balance, leg strength, and correct body alignment, and eventually facilitates the practitioner in the pursuit of martial art proficiency and excellence.